First, I want to thank everyone who has followed my blog and given me advice today. I really appreciate it! I am amazed at the amount of support there is out there for new bloggers. Oh, so the topic at hand: tagine. 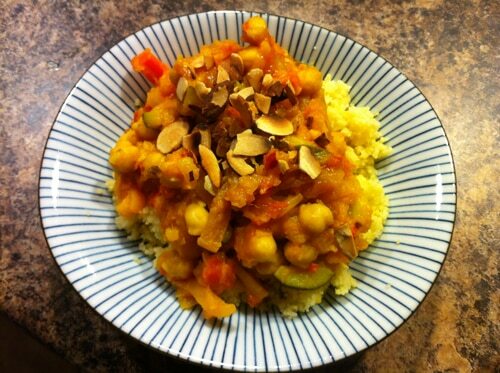 Tagine is a Moroccan stew. It’s easy to make, aromatic, and quite tasty. Since the husband (I need a cute nickname for him–how about El Guapo?) and I are moving in a few months, we’re desperately trying to use up all those condiments and sauces that have been sitting in the fridge for a while. One of those condiments is harissa . I bought it at Crate and Barrel last January–I had a lot of recipes that called for it and I could never find it at the grocery store, so it seemed like a good idea at the time. But then we tried it as a dipping sauce for samosas and it was so spicy that I feared my taste buds would suffer permanent damage. Okay, so harissa is not for dipping. At least not in the Ohkeeka household. So the harissa has been sitting in the fridge for a while. But being big ole cheapos, we can’t just throw it away, so we’re trying to use it up along with all the other things in the fridge. I decided to make this Vegetarian Chickpea Tagine from Fitness Magazine because I noticed that it used harissa, but only a little bit. If we can’t tolerate 1/2 teaspoon of it, we should just turn in our foodie cards, right? This recipe is a winner! If you’re looking for something filling (9 PointsPlus for a fairly large portion), delicious, and a little bit different, definitely try this. Apart from a lot of chopping, slicing, and dicing, there’s not much to it either. One of my goals in getting healthier this year is to find recipes that have decent portion sizes so I’m not still hungry after eating dinner, and this is perfect for that. On a slightly unrelated note, notice the awesome plate in the picture above? I bought it at Mitsuwa Marketplace while visiting family in Illinois for the holidays. They have a little shop (well, it’s barely a shop–more like a corner behind the food court) that sells ceramics and dinnerware from Japan and these plates were 2 for $10. The only thing that I love more than things from Japan is cheap things from Japan! And some of the plates had crabs on them! The only thing I love more than cheap things from Japan is cheap things from Japan with animals on them! So it’s been a good Sunday. 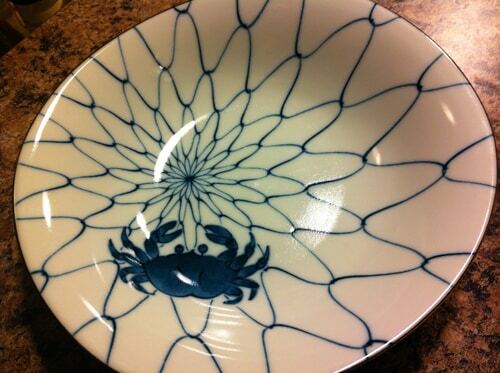 A laid back day, a super dinner, and my first occasion to use my new crab plates. The Type A Housewife is now Oh My Veggies! Oh My Veggies Reader Survey: The Results! I don’t think I’m going to attempt to get highlights again. I think the blogosphere is awesome and there are so many great seasoned bloggers who are always willing to help!! We're your blogs newest follower!! Thanks for the follow .. following you back 🙂 Love the name of your blog!! Thanks for stopping by Adventures of a Thrifty Mommy! I am now following you back! Hi there new friend, I'm following you back and btw I like that cream colour plate. Look forward to visiting your blog more often! What a cute plate! I totally love Japan too. I've never had Tagine before but it sure looks tasty! Thanks for the comment and the follow. Following you back and looking forward to reading more! Thanks for visiting my blog earlier this week. I am now following you back.